Park your car and enjoy this scenic waterfront location only minutes away from the center of activity in downtown Vancouver. You’ll find exquisite views of the marina, Burrard inlet and downtown skyline from this beautifully appointed, modern float home. Watch wildlife from the heated deck, hop out the front door for a run/bike along the waterfront Spirit Trail, or head downtown on the Seabus for great dining and entertainment. Living area offers a Sonos music system, 50” plasma TV with surround sound, Italian down-filled leather sofa, Toulemonde Bouchart rug, gas fireplace, and original artwork. The well-stocked kitchen contains cooking staples and more: Nespresso coffee machine, five-burner gas cook-top, wall oven, butcher-block counters and stainless steel, plumbed gas barbecue on the deck. Dining area comfortably seats six with additional seating available at the kitchen bar. With a deep passion for food and wine, we would be more than happy to set the stage for any of your gastronomic needs. Just let us know. A full-sized, executive desk and powder room are also on the main floor. Master bedroom with water views, luxury king-sized bed, flat-screen TV, mid-century furniture and original artwork. Both bedrooms supplied with Hotel Brand sheets and down pillows. A convenient bed/sitting room is located adjacent to the master bedroom and features a water view, comfortable double fold-out sofa bed and wall-mounted TV. Main bath is appointed with heated tile floors, double-head deluxe glass walk-in shower and Hotel Collection towels. Workshop available for storage and bikes. Laundry with full-sized stacking Whirlpool washer/dryer and full laundry sink. 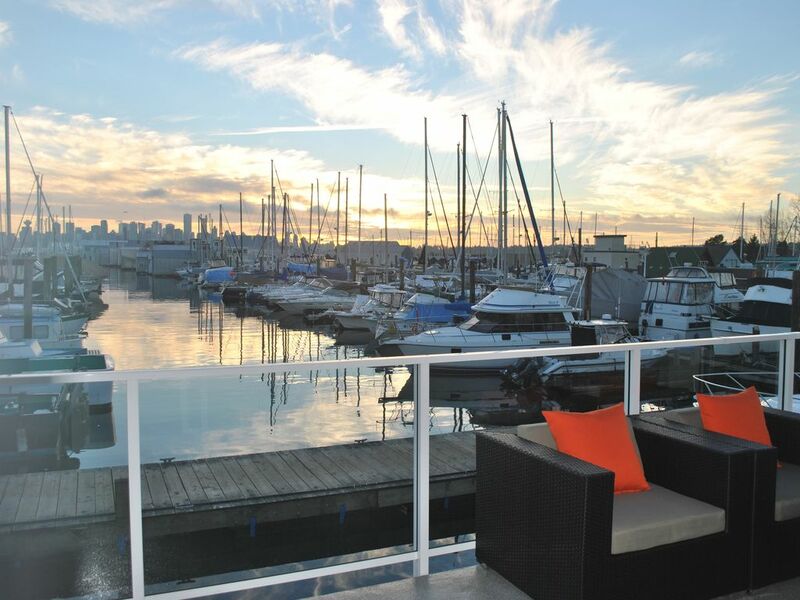 This float home is located in the most central and vibrant part of Vancouver and North Shore. A seven minute seawall walk to the Seabus & Downtown Vancouver. Steps from the redeveloped historic Lonsdale Quay waterfront, where there is a great selection of cafes, restaurants, shops and theatres. Transient boat moorage available directly through Mosquito Creek Marina. Inquire with owner for contact info. Leave your car in gated, secured parking and enjoy your surroundings by foot or take an easy drive to the ski slopes, golf courses, and countless hiking and biking trails on the North Shore. We have lived on the North Shore for 20 years and have come to love all of the activity and beauty that it offers. When we found this home we immediately fell in love with the location and setting. We will one day move into this wonderful home when we become empty-nesters. For now, we're happy to share this great location and setting with you. The home allows one to get away from it all and still be close to all the attractions Vancouver has to offer. Whether you want to hike the local mountains or wine and dine downtown, you will be close to it all. Enjoy nature and city living in one convenient location. This tranquil, modern, float home is a unique and memorable experience. Located in the outdoor playground of the North Shore with easy access to downtown Vancouver. Easy access to numerous mountain trails, three local ski hills, Whistler and Horseshoe Bay Ferry Terminal. A twelve minute sea bus ride to downtown, the Canada line and Vancouver International Airport. Foodies will enjoy the walk to the Quay for fresh, local seafood and produce that can be brought back and prepared in a gourmet kitchen. There is a workshop on the lower level for storing your bikes or tuning your skis. Power up the Sonos and enjoy your favourite music as you work. Steps from the Seabus terminal and a twelve minute ride to downtown Vancouver. Unique Float home sitting on the ocean in Mosquito Creek. Minutes to Downtown Vancouver via Seabus. 3 TVs with Surround Sound on main floor. Sonos system throughout home. Listen to different music in each location. Compatable with any music library on iPhone or Android. Large 9 x 21 foot Balcony with outdoor seating and heaters. Transient moorage available. Ask owner for information about reserving with marina. Being on the water was a unique experience. We really enjoyed our time and the location was super handy. Clean, modern & fantastic views. Be prepared for some movement from the floating home. Beautiful home & amazing location ! A beautiful unique floating home in an ideal location with spectacular views. Great choice of restaurants and cafes within walking distance. Easy access to downtown Vancouver on the seabus and great base for exploring the sights of North Van, West Van, local mountains, Bowen Island ferry and drive to Squamish and Whistler. We had the bonus of celebrating New Years on the heated deck with an amazing view of the fireworks over the city. Such a warm welcoming home to return to after a day exploring. Peaceful and serene, beautifully decorated and well equipped. Loved the bread, cheese and Perrier water on arrival. Linda is a great host- very communicative and helpful. The owner is extremely accommodating and pleasant to deal with. Would book again anytime. Beautiful! A fabulous, unique experience. Loved our 3 nights at Linda’s float home. Spotlessly clean, and very comfortable. Everything was well stocked, and thoroughly explained; and Linda was so willing to make restaurant/sightseeing recommendations to help us maximise our stay. Would return in a flash! Property is situated on the North Shore of Vancouver. Easy access to Highway, Downtown, Whistler Mountain and a multitude of recreational attractions and playgrounds. Walk to Lonsdale Quay for fresh produce, baked goods, butcher and shopping. Six screen movie theatre, restaurants and grocery store less then a ten minute walk away.